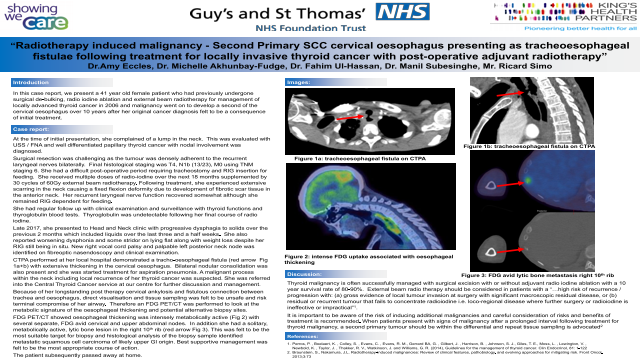 Abstract: Thyroid malignancy is often successfully managed with surgical excision with or without adjuvant radio iodine ablation with a 10 year survival rate of 80-90%. External beam radio therapy should be considered in patients with a “…high risk of recurrence / progression with: (a) gross evidence of local tumour invasion at surgery with significant macroscopic residual disease, or (b) residual or recurrent tumour that fails to concentrate radioiodine i.e. loco-regional disease where further surgery or radioiodine is ineffective or impractical”1.